While much of the media attention in the wake of the devastating Sulawesi tsunami was centred on the destruction and human tragedy, behind the scenes frantic efforts were being made to get vital aid and equipment to the areas worst effected. Assisting Indonesian authorities in managing the complex logistics task was 26 volunteers from German postal giant Deutsche Post DHL (DPDHL) Group’s Disaster Response Team (DRT) in Singapore. Working with officials from the Indonesian National Board for Disaster Management (BNPB), the Asean Coordinating Centre for Humanitarian Assistance on Disaster Management (AHA Centre), and United Nations (UN) officials, the DHL DRT volunteers helped ensure the rapid and smooth distribution over more than 3,500 tons of emergency relief supplies. 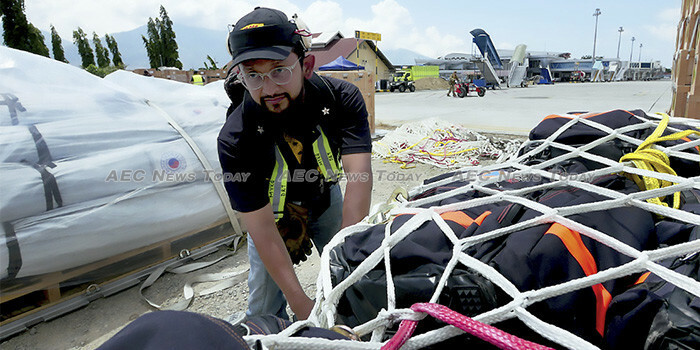 Trained, drilled, and rehearsed in the various scenarios and issues that need to be addressed and managed following a major disaster, Carl Schelfhaut, GoHelp manager, Asia Pacific, DPDHL Group ,said this deployment was “unlike any others the DRTs had undertaken”. Divided into teams of three on weekly deployments, the DHL DRT volunteers worked in shifts 24-hours a day at Palu’s Mutiara SIS Al-Jufrie Airport, and at the Sultan Aji Muhammad Sulaiman Airport in Balikpapan, which was a staging area for incoming aid shipments. Together with members of the UN and Indonesian authorities the group facilitated the dispatch of almost 3,500 tons of relief aid. According to Mr Schelfhaut the DHL DRT’s role saw them coordinating freight transportation across non-governmental organisations (NGOs), local airport authorities, and national military forces to ensure a smooth supply chain involving land, sea, and air transport. Of particular importance was ensuring that pallets that were sent somewhere containing relief supplies were returned to their respective owners so that additional freight could be sent and staging areas did not become congested. “It’s the first time that DHL DRTs have seen their role extend cross civilian and military administrators. We are proud to have been entrusted with such important responsibilities”, Mr Schelfhaut said. More than 2,100 people on the island of Sulawesi were killed and at least 1,000 remain unaccounted for after a tsunami with heights estimated up to seven metres (23ft) struck Palu, Donggala, and Mamuju following a magnitude 7.5 earthquake in the Minahasa Peninsula, jut after 10am on September 28. The force of the quake and resultant tsunami destroyed vital infrastructure including bridges, communications, and roadways. Palu’s Mutiara SIS Al-Jufrie Airport was closed due to a 500 meter (about 1,640ft) long split in the runway. Since 2005 DHL DRT volunteers from the company’s GoHelp disaster management programme have worked with the UN to help restore and manage logistics and supply chains in the wake of natural disasters. Comprising some 500 specially-trained employee volunteers worldwide, DHL DRT volunteers are able to deploy anywhere in the world within 72 hours. Since its establishment DHL DRTs have deployed on more than 40 occasions in response to natural disasters in 20 countries. The first DHL Singapore DRT volunteers arrived in Sulawesi on October 4, with the deployment ending on October 26. The 23-day mission is one its longest to date in the region.